Nest HQ is a dance music culture site, associated with musician Skrillex and his label OWSLA. It recently posted a short video, “Blockchain & the Music Industry,” about Ujo Music and ConsenSys’s offering to musicians. If you’ve read Attack of the 50 Foot Blockchain, you’ll recall that Ujo Music was involved in Imogen Heap’s 2015 release of her song “Tiny Human” on the Ethereum blockchain, in the publicity for which Heap declared that “its success will come from the adoption of millions of music lovers.” With widespread publicity and hundreds of articles in the blockchain, music and general press, it sold a grand total of 222 copies, for a gross take of $133.20 — not $133,200, but one hundred and thirty-three dollars and twenty cents. The book details the many points at which the initiative stumbled, most involving the primitive state of the Ethereum ecosystem at the time. In the wake of the “Tiny Human” disaster, Ujo posted an apologia in which they admitted that they’d only researched any of what they were trying to do after they’d done it: “We are but a few bright-eyed technologists with a special hammer, looking for the right nail.” This phrase is not a winning formula for any new project. This documentary was designed to make technical concepts about blockchain easy to understand and accessible for those just getting into the space without sacrificing the necessary technical terms and language. At 2:40, the Ujo offering is described: a smart contract that you send a specific amount of ether, and you get back access codes for downloads in various formats. So it’s a web-based record shop like Bandcamp, but with ether. However, this is posited not as an alternative to web shops for independent artists, but to the complicated major label record industry. At 3:40, they claim that a web-based shopping site, but on the blockchain, can be generalised: “this use case within the art and entertainment community extends into the realm of finance, politics, transportation, agriculture and beyond.” This is completely unsubstantiated, but the pictures are pretty. “There are few limits to what blockchain tech can and will do” — except the limits of feasibility, scaling, understanding the specific domain you’re trying to fix, and every other such problem that’s left blockchains in all fields long on hype and embarrassingly short on real-world running production systems. At 4:00, the video returns to resentment-based marketing to artists, implying that the blockchain as supplied by Ujo will solve all their problems. If you can get people feeling resentful and then claim you have a solution, you can sell them anything, whether or not it’s feasible, usable or even functional. But it’s heartwarming to see how keen all these “blockchain” people are to helpfully intermediate between you, the artist — their eternal and only concern! — and the prospect of money. There’s an odd bit at 3:30: “there is little need for middlemen such as BMI or ASCAP.” These are two non-profit organisations that collect publishing and performance royalties when someone uses a song you wrote or plays it live — rights which exist in copyright law, and that you can’t magically nullify by selling a song on the blockchain. It’s not clear why the “take that!” at these two bodies in particular, and not anyone else in the music industry, but it is clear that Ujo sees them as their direct competition in this endeavour. Simon de la Rouviere from Ujo has blogged about the infrastructure for their offering. The web portal was hand-constructed for RAC, but they plan a semiautomated portal setup page. The architecture is not decentralised and distributed “as yet”. The music files are served from Amazon S3. They hypothesise moving to IPFS, which (a) is still fancy BitTorrent, and you’re going to have to seed the files from somewhere (b) still isn’t finished. a modular approach, where specific problems are solved incrementally, building up an open and transparent meta-system ensuring the individual systems that address the sub-problems use open standards and globally acceptable and accessible data, for example residing in one or more blockchain-based systems. This is pretty much the obvious answer — build workable stuff from the ground up rather than the top down — though without a gratuitous blockchain. 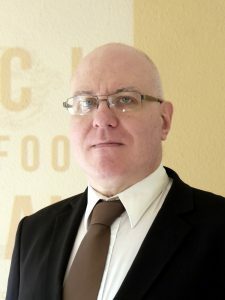 COALA IP is Ujo’s proposal. Unfortunately, it appears from their sites that they didn’t ask anyone from the music industry — just “lawyers, computer scientists and entrepreneurs”, mostly from the blockchain space. This is after posting an apology for not doing their research. 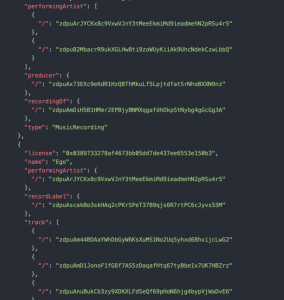 Ujo has also posted about Ethereum as a payment processing system. They describe the problems with present systems — “the intermediaries need to process millions of requests per minute, store large amounts of data, run up a large overhead and charge fees to cover their overhead to stay in business” — then claim Ethereum can and will do a better job. This is trivially false. The post starts “Making a purchase on the web may feel like a seamless way of sending money” and notes “on the consumer side, this works well — offline with a card and online with a card number.” They then lament the complexity of the systems that make it even possible to offer this user-friendliness, at a vast transaction rate across the whole world. Their contrasting claim is that the software will be easier to implement in Ethereum — and they then completely fail to note the ridiculously user-hostile clunkiness of dealing with cryptocurrency in any way, nor how fatally easy it is to lose all your money irretrievably through simple human error. (No chargebacks!) And Ethereum can only do less than 1000 transactions per minute, total worldwide — that’s already not enough to cope with its own popular ICOs, e.g., the Bancor and Status releases that rendered the network unusable for hours at a time. Existing systems are large and complicated because they do a large and complicated job. Anyone can posit an easier version of something if they don’t bother with the hard bits. So let’s look at the UJO X RAC website. The first thing you see is that Ujo have not yet worked out how to do portable web design: “The Ujo Store is currently only compatible with Chrome.” You can only buy the album on a desktop PC running one particular web browser. To buy the record, you need to install MetaMask, an Ethereum wallet in a Chrome extension. The page also has a “Tip RAC” button, which doesn’t do anything if you don’t have MetaMask installed. The “How To Buy Album” link goes to a page on how to use MetaMask, which links to how to buy Ethereum at Coinbase (rather than ShapeShift as with “Tiny Human”), including how to send them your comprehensive identity theft kit. Could not install package: ‘UTILITY_PROCESS_CRASHED_WHILE_TRYING_TO_INSTALL’. Could not install package because a utility process crashed. Try restarting Chrome and trying again. If you manage to buy the album, you get an EGO badge, an ERC-20 Ethereum token. “Your support of the RAC x Ujo project is forever memorialized in this token as a reputational badge that is verifiable, exchangeable, and most importantly, valuable on the Ethereum blockchain.” Not sure about that last claim. At the end of the page is “Click here to join the conversation”, which goes to ujomusic.herokuapp.com, which doesn’t work. The Ujo Music site itself shows similar care and attention to detail. The first thing on it is “In 2015 Imogen Heap collaborated with Ujo to demonstrate how Ethereum could usher in a modern music supply chain built on a backbone of prompt and transparent payments — more details“, the link going to www.alpha.ujomusic.com, which doesn’t exist. EGO seems to have done a bit better than “Tiny Human” did. If you look at the token address, you can see that 139 EGO tokens exist, giving a total take of $1390; not terrible for a completely independent production. You can see every token creation there (any token transfer starting “From: 0x0000000000000000000000000000000000000000”). Ujo says that “on the first day of the RAC release, he made more money from tips than he did from sales,” but we’re not talking about a huge amount in sales. And this is different than selling an MP3 album on mp3.com or myspace.com how? If you have to go to a site hosted by company X to do a transaction via the service of company X, then I see no difference, all buzz aside. Ujo is running a centralised record shop, like Bandcamp but worse. Bandcamp is strictly superior in every regard as a record shop, takes 15% as their cut, the paying customers love it, and it pays you in actual money rather than Internet pogs. If you don’t like a centralised shop like Bandcamp, or giving them 15%, you can sell a record from your web page via PayPal. Or sell it on the blockchain for ether yourself in the same way. (I actually tried setting up merchant sales through Coinbase, but they’ve so far been utterly incompetent. But that’s a forthcoming post.) In 2017, it’s really easy to publish creative works independently; I’ve just sold 2400 books. The hard part is the promotion, not the mechanics of distributing and selling the thing. Of course, the music industry now gets the lion’s share of its income from streaming. Ujo’s Ethereum web shop is in many ways solving last decade’s problem. RAC’s album is also up on Spotify, with nary a blockchain in sight. Ujo Music are asking a lot of the right questions. But they don’t have answers, only promises that they might come up with answers in the future. Fundamentally, they are still starting from “blockchain!” and trying to find a problem it can be applied to, rather than starting with a problem and trying to solve it. Update: ujomusic.herokuapp.com is now working — looks like they paid their Heroku bill. it’s a signup page to join their Slack chat channel. If Ujo is claiming the industry is terrible and calling out ASCAP specifically, more power to them. Don’t contradict them based on a quick web search for the acronym! I’ll take your word for it when you say Ujo isn’t using that big distributed ledger properly. That’s you’re area of expertise. Heh. I’m quite aware of occasions on which ASCAP has unfortunately failed to make friends amongst its putative base, and I note one in the book (how for a long time all live income just went to the top 200 touring acts in a year), as an example of just how hard proper collections are without really good data. They’ve still got a more trustworthy organisational structure than Ujo. I’m a big fan of what collection societies can and should be, to the point where I wrote an article in my indie rock fanzine in 1990 exhorting local songwriting musicians in bands to sign up for APRA (page 10 of this PDF). It’s a bit different in most countries other than the US – rather than multiple competing collection societies, you tend to have a single nonprofit given statutory monopoly status. Which evens the playing field. Ujo could legally position itself as a competitor to ASCAP/BMI in the US, but mostly couldn’t in the rest of the developed world. Re: ‘COALA IP is Ujo’s proposal. Unfortunately, it appears they didn’t ask anyone at all from the music industry — just “lawyers, computer scientists and entrepreneurs”’. I’m one of the co-authors of the COALA IP protocol. We and our collaborators in COALA IP, including the Ujo folks, engaged with countless artists over a period of years, gathering feedback. The COALA IP protocol is a direct descendant of DDEX – a music industry standard that’s in widespread use. We’ve iterated with the DDEX authors as well. COALA IP and DDEX are in fact two protocols in a long lineage of ever-improving protocols. In short: the claim that COALA IP authors “didn’t ask anyone from the music industry” is completely false. Perhaps *you* should have asked the COALA IP authors. That’s good to hear, but I fear you need to make it clearer on your various websites. I did look closely for examples of this specific case and was quite disconcerted not to see them, at all. I’ve clarified that this was based on your public information. I encourage you to avoid the double standard to serve your needs. “Based on your public information” versus “didn’t ask anyone at all from the music industry”. One single click from coalaip.org takes you to https://github.com/COALAIP/specs, which gives many references to DDEX and LCC. So do many other support materials. If you know music industry at all (or do a teensy bit of homework), you know of DDEX. If you look at any talks we give on ascribe (they’re easy to find online), you’ll see us celebrating the artists we work with, such as Harm van den Dorpel. People like Harm are great collaborators because they understand both art and code. And there are ongoing collaborations with music industry folks, such as OMI. This all public and easy to find. Eg http://open-music.org/members/. All of us will happily admit: this hasn’t hit mainstream yet. There’s still work to be done. But make no mistake, we’ve all been working closely with the artists and their industries. You don’t have to look hard at all. Nobody is denying the scaling problems, nor are they saying the perfect system or “solution” exists yet. We’re still at the very beginning, as I’m sure your book discusses. I wonder if you’d say the same things to those who dreamed of Chrome when Netscape first came out. Or of Apple’s iPad when 2001: A Space Odyssey introduced the theoretical IBM NEWSPAD in 1968? “We can’t do it now, therefore it is impossible and nothing should be done to get us there” is a dangerously flawed way of thinking. While I appreciate your criticisms of the current stage at which blockchain and IPFS tech exists, I implore you to constructively add to the conversation rather than detract from what is currently being said. Well, yeah, actually they are denying them, or ignoring them, as I cite above re: Ujo’s own comparison of the conventional banking system to Ethereum. It’s really not enough to handwave; handwaving has a bad track record of visible results in the blockchain space. The most important thing about proposed scaling solutions that don’t yet exist is that they don’t exist. If your go-to technological comparison is things that worked out well, you’re already assuming your conclusion. The pathological example is the commonplace Bitcoin excuse “But if Bitcoin is like the early Internet …” Even assuming it’s automatically comparable to the greatest revolution in human communication since the printing press is a HUGE hypothetical. Why is it comparable to a few technologies that succeeded? Why isn’t a more appropriate comparison the many more that didn’t? “Bitcoin is like the Apple eWorld of money! Bitcoin is the Windows ME of money! Bitcoin is the Ford Edsel of money!” Those are exactly as justified as comparisons. Reasoning by analogy is insufficient, particularly in the crypto space. Produce some reason anyone should think it will get better. Handwaving is not enough. 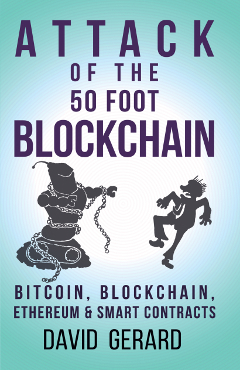 Book news: Stock up on 50 foot blockchains for Christmas! With affiliate links!